To make a purchase from ClubShop you must register for an Account online from this website. Purchases must be paid in full at the time of order placement by an approved credit or debit card. After placement of an order via this website you will receive an email confirming your purchase. The email will also include a PDF attachment of the invoice. This invoice number will be used in all future correspondence regarding the order. Our Customer Service Team will send a further email upon dispatch of the order. Once an order has been submitted through this website it can only be cancelled prior to shipping. Production Times vary depending on the ordered product. In general most clothing items will be ready for dispatch within 7-10 working days. 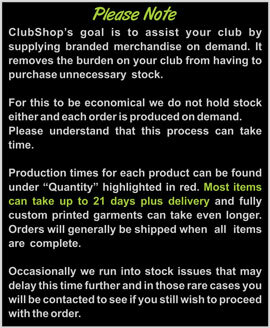 All other club merchandise will generally be made available for dispatch within 5 working days. Please note these production times are in addition to the delivery times further detailed within the Terms and Conditions of this website. All production times are estimates only. If we are unable to meet our production time estimate our sales team will make contact with you to discuss this further. At this time you will be given the option of cancelling the order or undertaking to accept the new production criteria. When purchasing products from this website you may receive two options for delivery from which one must be selected. These options may include pick-up from your club (optional depending on your clubs choice of delivery method) and delviery. Times for each option are detailed below (Delivery Times). Please note these delivery times are in addition to the production times further detailed within the Terms and Conditions of this website. Delivery times vary depending on the option selected. Please note these delivery times are in addition to the production times further detailed within the Terms and Conditions of this website. Pick Up From Your Club: 2-5 working days after product completion. All delivery times are estimates only. We will not be accountable for any liability arising out of late delivery. Products must be returned to us in the exact condition and packaging in which they were received in order for us to process a refund or product exchange. If you have received a product deemed to be returnable under our Returns Policy we ask that you complete the Returns form on the My Orders page of the ClubShop website. The product must be returned to the address below along with all original packaging and a copy of the invoice with the RMA Number you received when completing the form on the My Orders page. Products may be returned via your club contact for ClubShop or via Post. If posting the product we strongly suggest that you use registered post as ClubShop is not liable for return parcels that are lost in transit. Once the return is received we will process the required paperwork within 24 hours and send you an email confirming your request for refund or exchange. Refunds will be deposited into the same account from which the purchase was made. Refunds will occur within 24 hours of the confirmation email. Your issuing bank may take an extra billing cycle to apply the credit to your card. In the event of an exchange normal delivery times and processes will apply.